Initially i didnt add rhinestone is the center, so here are few pictures of non-bling version. I just love this manicure, its colorful and came out so crisp. Its been three days since i did this nail art and everything is still intact. I hope you like this manicure too. 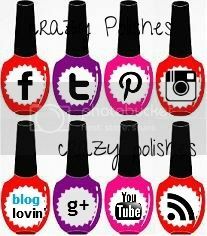 You can buy FUN 17 stamping plate from Fab Ur Nails store. Hey! Lovely nail art there. Also, is there any way there's a Fab Ur Nails group buy to India? Shipping is quite expensive.